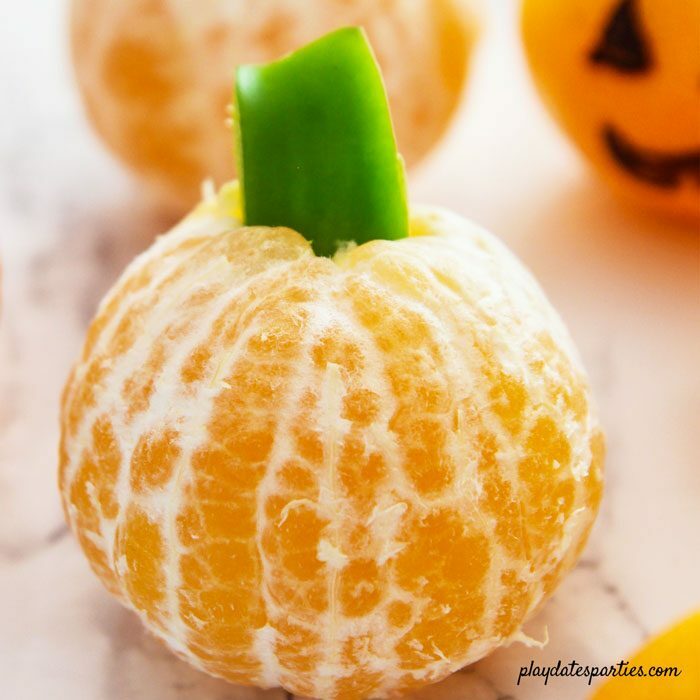 Clementine pumpkins are the perfect make-ahead healthy Halloween snack for kids. 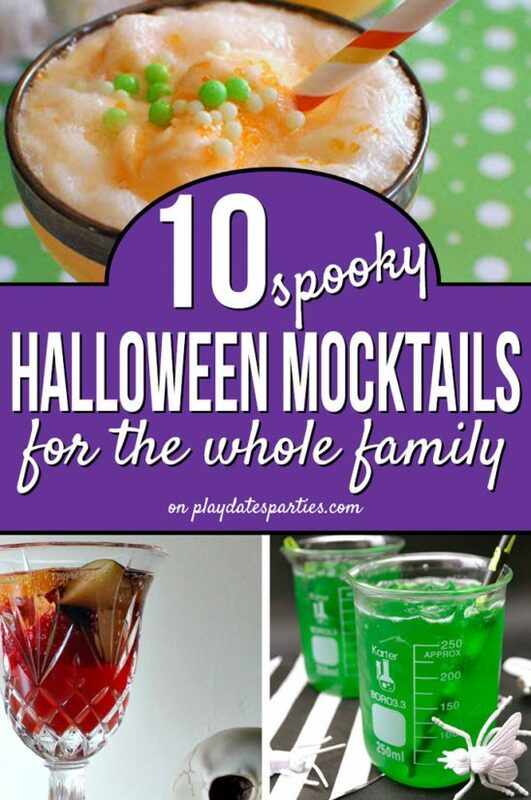 Add them to your kids’ lunchbox or make a bunch for a Halloween party! This question pops up every fall with my girls. Ever since the first time I surprised I now nine-year-old with the Clementine pumpkin in her lunchbox, this question pops up every fall. Now, I’m not a mom to make cutesy fiend Bento boxes every day. That’s just more time and energy that I have… especially when I’m making lunches for three kids every day of the workweek. But, I can easily pulled together something simple like a Clementine pumpkin. I don’t know where I first saw the ideas for the these but they have become a full tradition ever cents. Gently insert You’re child’s favorite Green vegetable into the center of the Clementine where the top was. Which vegetables work best with Clementine pumpkins? Celery sticks work well because they are mild in flavor on their own. Unfortunately, my children don’t care for celery so the celery sticks end up getting wasted. Because of that these are not my favorites. Sliced green bell peppers work well if you’re like us and keep sliced peppers on hand every week already. That said, they have a strong flavor which may affect the taste of the clementine. Picky eaters may not be happy about that. Sugar Snap Peas work well when they’re still firm and fresh. They don’t add any flavor to the clementine, but they also don’t have the same characteristic shape as the celery or bell peppers. 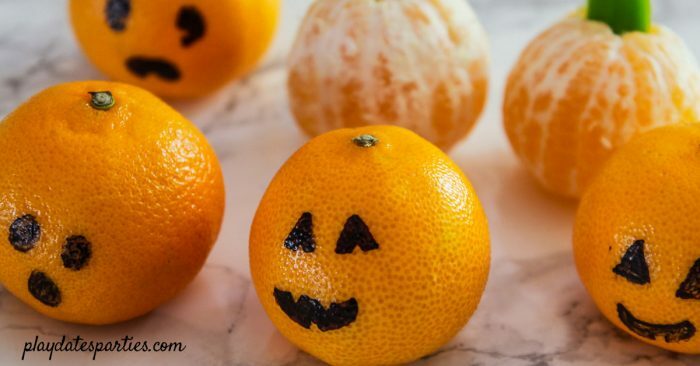 Once your kids are old enough to peel clementines on their own, clementine jack-o-lanterns are a lot of fun. All you need is a black Sharpie and your imagination. That said, if you don’t know the right tips, clementine jack-o’-lanterns can get pretty frustrating. Always always always start with a dry, room temperature Clementine. Because Sharpies are oil-based any water on the skin of the Clementine Will resist your design. Cold clementines will sweat, ruining your design and leaving you frustrated. Keep at least two or three black sharpies on hand as you decorate. Sometimes the Clementines just don’t warm up fast enough. In this case you will want to carefully drive the Clementine with a paper towel and make your design as best you can. If your Sharpie stops working, swap it out for another Sharpie for a while. This will allow the water that got on the tip of the first sharpie to evaporate so that it can work again. Keep your designs simple. I found that ultrafine point sharpies that looks more like ballpoint pens do not work well on Clementine pumpkins. But the standard fine tip sharpie can create a line that’s a bit fat for the small Clementine. If you keep your design simple, and outline the jack-o’-lantern face shape first then you should end up with a cute design. You don’t have to be a Bento box mom to send cute seasonal themed treats in your kids’ lunches. Clementine pumpkins are hands down my favorite way to surprise my kids in the lunchbox. And it only takes about five minutes or less to make a Clementine pumpkin or a jack-o’-lantern pumpkin. But the smiles are always worth it. What a cute idea! Thanks for sharing at the What’s for Dinner party! Have a wonderful week and hope to see you at next week’s party too! Very cute! I once did a bunch of these pumpkin oranges for a teacher appreciation event. Visiting from Inspire Me Tuesday. Nice to have a healthful alternative in the midst of all the candy! Cute and easy! I usually love this time of year, but it’s been so rainy in Nebraska. I just want to skip this season. Totally easy and what a great decoration on the table when guests come over. Thanks for sharing! 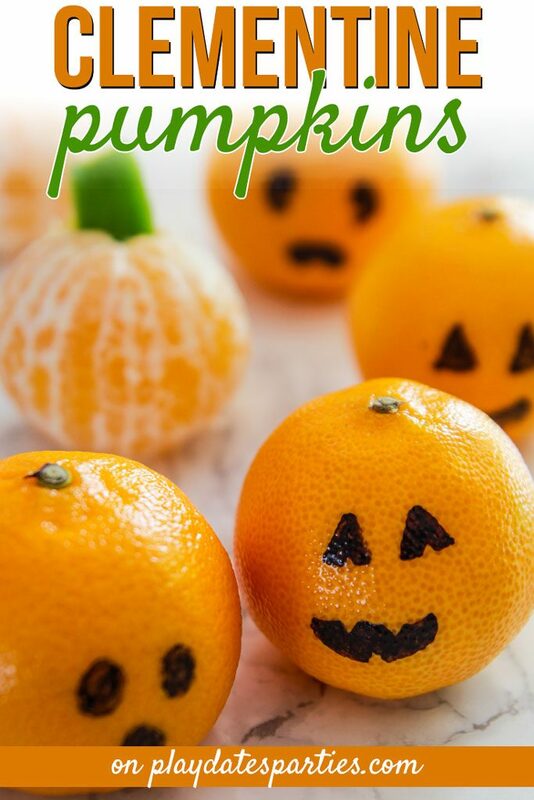 Oh those clementine jack o’lanterns are an awesome idea! i think it would be great to put in the kids’ lunchboxes until halloween. thanks for the idea! What a cute, yet simple idea to make the season a little more festive! These are adorable!! I’m keeping them in mind for my daughter’s Halloween party. Thanks for sharing and for linking up with us today. Adorable idea! 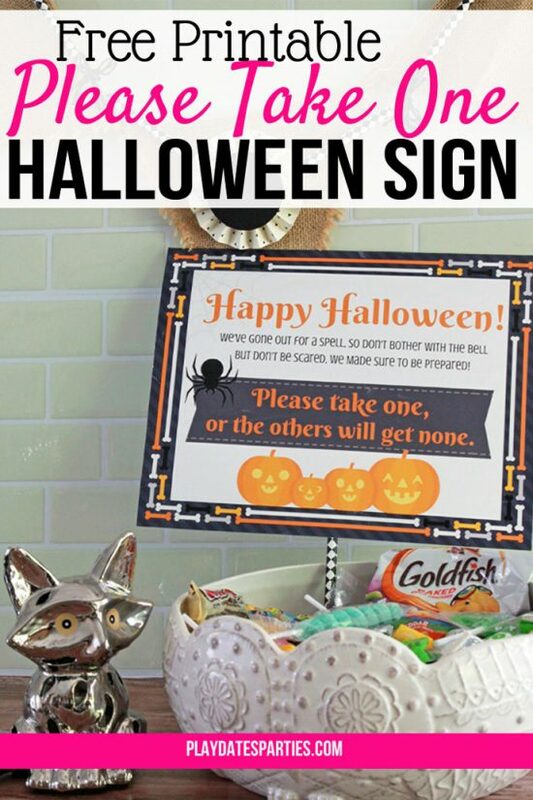 I love these fun things that can be done last minute. Pinning! What a fun treat for kids!! Thanks for sharing them with SYC. Very very cute. My kids would have loved these when they were little. I will have to make these for my niece and nephew! I would love for you to share these at Thursday Favorite Things at my blog! What a great healthy Halloween snack idea! Featuring on Inspire Me Monday on not a trophy wife dot com. So Easy and Colorful. Healthy too. 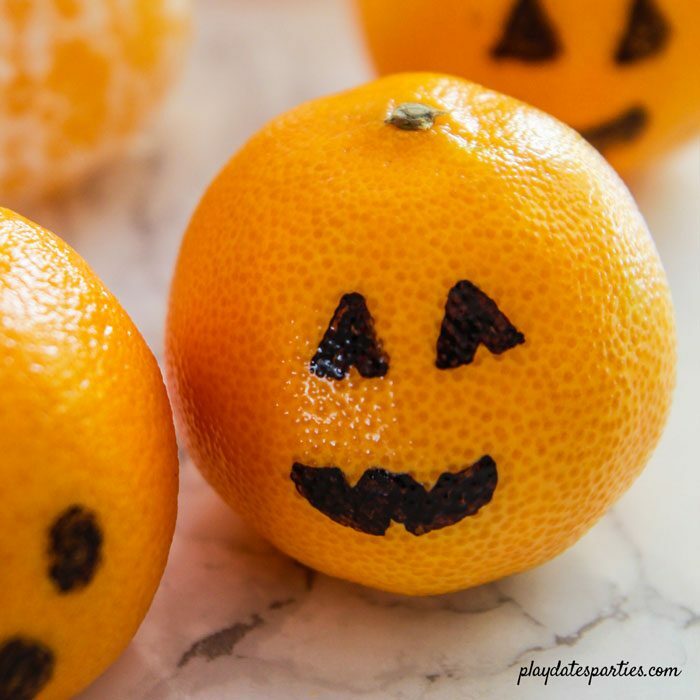 Your Clementine Pumpkins look so adorable and healthy for the kids! Thanks so much for sharing with Full Plate Thursday and have a great week! Hi Leslie! I love this healthy, fun alternative to candy for celebrating the season. I love the simplicity in this. With so many sugary sweet treats in October, it’s nice to have a healthy alternative that is still festive. Stopping by from Best of the Weekend.